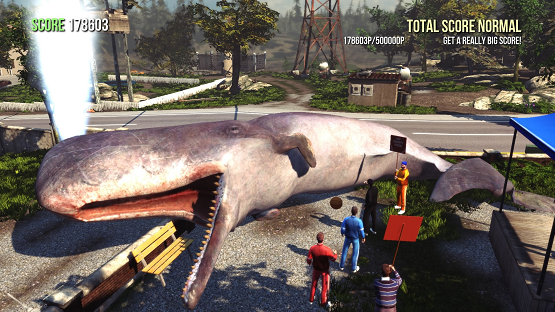 Goat Simulator is a completely stupid game and, to be honest, you should probably spend your money on something else. Seriously, the description of the game on PSN says this verbatim. The name is a parody of the recent spat of simulation games that we’ve seen, even mimicking the font and style of Farming Simulator pretty directly. Aside from this naming parody, the game is in no way a simulator style game, unless of course, with my generally suburban lifestyle, I know nothing of goats, in which case Goat Simulator might just be the most accurate representation of being a goat ever. 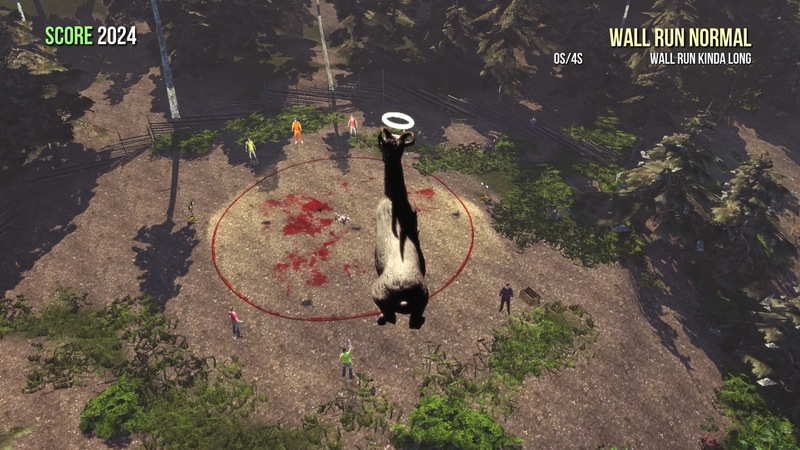 In Goat Simulator, players will step into the hooves of Goat, the titular lead character who… well… is a goat. And admittedly, she doesn’t actually have a name in the game, I just decided to call mine Goat, because, let’s face it, it fits. The game is an Easter egg-filled physics playground that plays like a very loose cross between Tony Hawk and PAIN. Players send their goat careening around the level, headbutting things, licking objects — at which point the tongue becomes a tether — and launching themselves off of anything that will send them catapulting into the air or cause mass destruction, because goats. The physics in the game are atrocious and full of glitches, but that’s supposed to be part of the charm. Ridiculous graphical stretching of models and textures, hilarious ragdoll physics, and even goats climbing ladders are just a few of the ostentatious presentations of the outrageous physics in Goat Simulator. Leaping from a crane, I managed to tether my tongue to a hang-glider to be whipped around the level until I released myself and was flung into the giant blade of a fan which smacked me like a baseball to the other side of the level and into a massive boulder, which of course rolled down the hill and literally crashed some poor guy’s backyard barbecue. Hidden throughout the two levels are a vast wealth of fun little Easter eggs — some out in the open, and some very well hidden — that give a few chuckles here and there. Find a beacon in a garage, put it in the crop circle, and an alien ship will come warp you to space. Sacrifice some goats (and possibly a human or two) at a demonic pentagram in the forest, and you’ll gain the power of the mighty Devil Goat. You can even party as Deadmau5 on top of a skyscraper, after headbutting him out of his own gig. Once you’ve seen each of these Easter eggs though, which will take a few hours at most, there’s very little reason to go back and re-experience them and the levels begin to feel small and rather empty. There’s honestly not all that much stuff to wreck and tear up either. Mutators do offer a fun way of changing up the game’s physics, from something as simple as giving your goat the ability to double jump, to the pointlessly ludicrous Huge Goat mutator that turns your goat into a massive, slightly wiggly, beached whale. There are a ton of these to play with, some unlocked from the beginning, and some gained through the aforementioned Easter eggs. Even the combinations of multiple mutators can offer unpredictable results, and new ways to play in the playground. The problem is that the oddity quickly wears thin. There are only so many times that I can ragdoll my goat across the level, smashing into an invisible wall as I realize what a tiny box the levels are contained in, before it just feels dull and without purpose. Half the time I found myself fighting with the ridiculous camera system to try to even see the hilarity that was ensuing. There’s some really funny stuff going on here, but the camera that won’t auto-level itself tends to make sure you only see a fraction of the full goat simulation. Goat Simulator on PS4 features up to four player splitscreen, but even this didn’t give the game much more purpose aside from an odd race or challenge, and only meant that two of us were now subjecting ourselves to the absurdity, as opposed to just one. There’s an extremely loose point system associated with running your goat around the level, but nothing so substantial that I found myself actually trying to get points or combos. In fact, the game pushes chaos and destruction, but flounders when giving the player any kind of significant reward or sense of having just done something awesome. I headbutted a massive stack of boxes and sent them scattering and crashing into each other and other objects for a rather spectacular display, but only got points for the single box that I had headbutted. I know, this game isn’t about points or goals, but why put the effort into adding this feature without giving players more of a sense of satisfaction? The popularity of Goat Simulator seems like a meme that got out of hand and has been going on for far too long. The console release feels necessitated by the social popularity of the game, not because it is a platform that needs it. With the PC release, you have modding which can offer potentially limitless community supported entertainment in the playground. With the mobile release, you have a great way to kill time with some quick, stupid fun on the go. What does the console release do for the game? You can bet that the physics playground of Goat Simulator on consoles will find itself old and dilapidated pretty quickly, having been built in the wrong part of town. 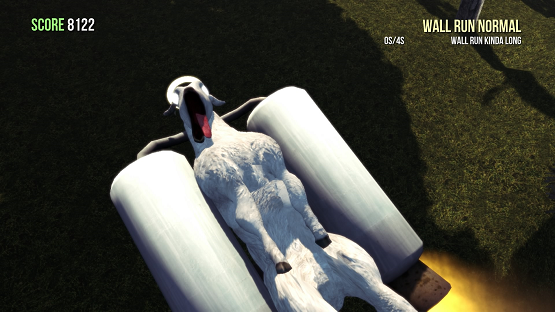 Goat Simulator is unapologetically absurd but fails to meaningfully give players anything to do beyond the occasional ridiculous party trick. It was a fun ride for an evening or two, but the novelty quickly wore off as I found myself fighting with poor mechanics that add nothing to the rapidly repetitive zany nature of the game. Don’t get me wrong, it has its funny moments — I mean, you’re a physics-centric goat that kinda, sorta wrecks some stuff and can turn into a whale — but the moments fizzle out all too quickly. It’s not that it’s bad. It’s just really not all that good. Goat Simulator review code provided by publisher. For more information on scoring please see our Review Policy here. What is with the terrible camera?